We continue to offer support for the duration of your active subscriptions. Also, documentation remains available, should you need it. If you have any questions or concerns we’re happy to help, just open a ticket. 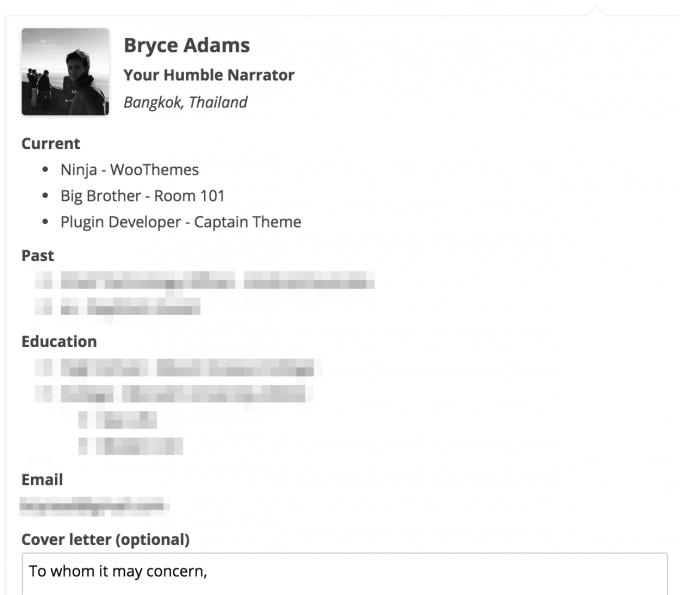 This plugin requires WP Job Manager 1.12.0 or greater to function. 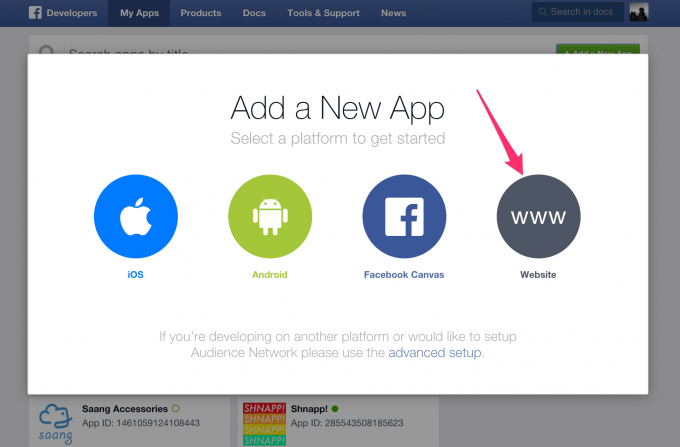 Once installed, you’ll need to create an app in Facebook Developers. Click Add a new App to get started and then choose ‘Website’. You should then enter an app name. You can then click Create App in the popup. You can ignore the next page, so just hit Skip Quick Start to finish the app creation. The important part is here. You’ll be able to see your App ID at the top of the page, just beneath the app title. Copy this. Now head over to your site. In the admin, go to Job Listings > Settings > Apply with Facebook and enter in your App ID. There are a couple other settings worth noting too. Cover Letter Field: You can choose whether or not the ‘cover letter’ field is visible when someone applies with Facebook. It can either be optional, required or hidden. Allow Facebook Field: Add a field to the job submission form, allowing employers to enable/disable Facebook applications. Let’s go back to Facebook now. Under Settings for your app, you should set a Namespace and Contact Email. You then need to click + Add Platform and choose Website. Fill in your site URL and save. The button should now be working on your site. Note: You’ll want to do the app approval as explained below before it will work for candidates. You (the app creator) can still test it out before hand, but for candidates to use it, the app should be submitted to and approved by Facebook (quick process). Which is basically asking you to submit your app for login review. To get certain information that’s useful for the application, we need to ask the candidate for access to their work and education information, both of which prompt Facebook to ask us to request app approval. It’s easy enough! Click Submit for review now to get started. For each, you should check “Adds people’s information to an account or profile” and choose the web platform. 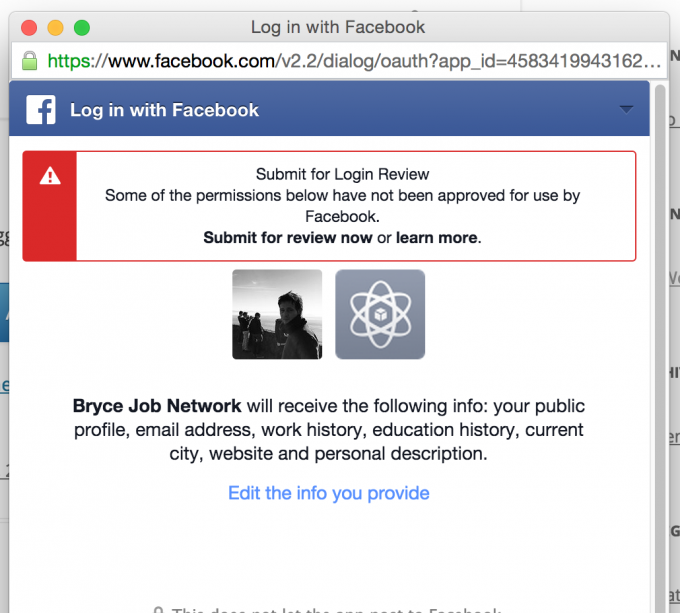 Then, record a screencast of you applying for a job on your site using Facebook. You can upload the screencast to a service like YouTube or CloudUp and send in that URL. That should be enough to get approved 🙂 Submit and you’re in the clear! If you have any issues with this process, please let us know. The “apply with Facebook” button will appear below job listings which have an application method set to an email address. This is because the Facebook application will need to be emailed to the job poster. The application will be sent to the employer and if you have Applications installed, saved as an application. 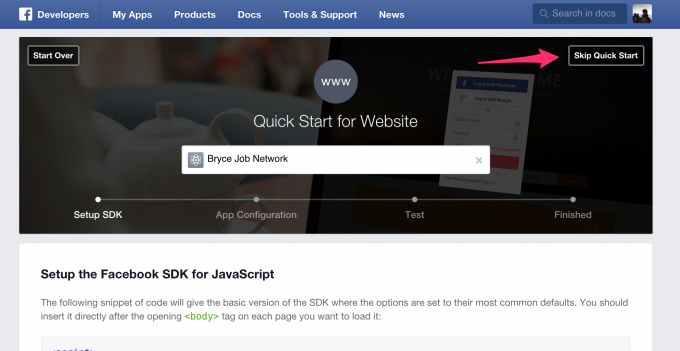 By default, candidates can apply via Facebook to any job on your site (as long as it has an email application method). If you prefer, you can let employees decide whether or not to allow Facebook applications on a per job basis. If the employer does not enable this option, then the Apply with Facebook button will not be displayed on the job page. Some of the application information is not imported from Facebook. Note that individuals can change the information that they provide to your app from their Facebook settings, so if they choose not to share their employment info with your app for example, then that won’t be imported when they use the Apply with Facebook button. The Apply with Facebook button does not display on the single job page. If you have enabled the “Allow Facebook Field” option in Job Listings > Settings > Apply with Facebook, that makes the Apply with Facebook button optional, and it must be enabled separately in each job, by enabling the “Allow Facebook Applications” option in the Job Details section.